A brilliant 96th minute goal line clearance by Maynor Figueroa secured an important draw for the Latics at Craven Cottage. Fulham had taken the lead after a stunning 25-yard strike by Giorgios Karagounis and an equally impressive strike by Franco Di Santo had drawn the sides level, but it was Figueroa’s injury time heroics that ensured the sides shared the points. Fulham had Mark Schwarzer, Damien Duff and Mladen Petric returning to their starting line up while Wigan were without striker Arouna Kone, who is now on African Nations Cup duty with the Ivory Coast. After a tentative start to the game by both teams, Franco Di Santo had the first of several good chances to give the away team the lead. Good interplay by Emmerson Boyce and James McArthur gave Di Santo a golden opportunity but the Argentinian miskicked inside the six yard box and the linesman flagged for offside, although subsequent television replays showed the Wigan player to be onside. Soon afterwards James McArthur fired over the cross-bar from 25 yards after dispossessing Bryan Ruiz in midfield. There were several moments of uncertainty in the Fulham defence but Wigan failed to capitalise. At the other end Wigan were conceding too many corners and defender Ivan Ramis was lucky on a couple of occasions when he gave the ball away in dangerous positions. Fulham took the lead on 22 minutes when Karagounis was allowed too much space on the edge of the Wigan box and the Greek midfielder’s powerful angled shot gave Ali Al Habsi no chance. Despite having their share of possession Wigan were giving the ball away too easily with Di Santo, Jean Beausejour and Ramis being the prime culprits. But they should have equalised when Di Santo missed another great opportunity inside the six yard box following an incisive cross by Boyce. 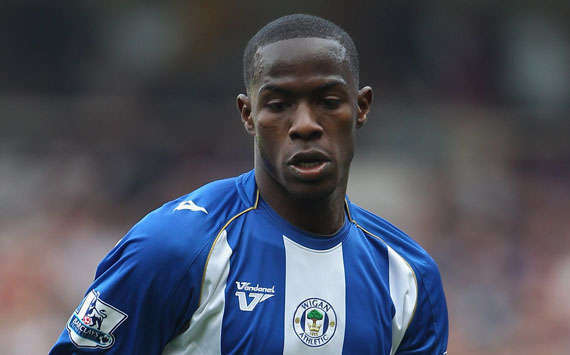 It was looking as though Wigan would rue the departure of striker Kone to the African Nations Cup. As the half drew to a close there was a feeling that neither side had been at their best, although Fulham had a slender lead Wigan had had the better chances. Neither team made any changes at half time and the second half started in scrappy fashion with both teams giving the ball away far too easily. The match sprung into life when Shaun Maloney’s deflected 25-yard effort was superbly tipped onto the bar by Schwarzer as Latics tried to draw level. Kieran Richardson produced a great piece of defending when he slid in to deny Di Santo in the penalty area after good work by James McCarthy, before Maloney’s shot stretched the Fulham goalkeeper. Di Santo did produce a sublime piece of skill when he flicked the ball up and volleyed on the turn but his shot went inches wide of the post. Wigan were now on top, but there was a feeling that they might have wasted too many chances to get a result. Petric was replaced by former Wigan striker Hugo Rodallega as the Fulham manager Martin Jol tried to redress the balance of play. Despite having so much of the play it was still something of a surprise when Wigan equalised. Di Santo had tested the patience of the Wigan fans with some poor finishing and many managers would have withdrawn him for loan signing Angelo Henriquez but Roberto Martinez’s patience was rewarded when Di Santo scored. He moved unchallenged towards the Fulham goal and inexplicably the Fulham defenders parted to allow the player a clear sight of the goal and the young striker unleashed an unerringly powerful shot past Schwarzer. It was an important goal and the first goal in fifteen games for the recently capped Argentinian international. Wigan’s equaliser gave them a definite boost and they proceeded to pressurise the Fulham goal. They forced a series of corners but the final cross or shot was always missing. In fact it was Fulham who nearly regained the lead when a dangerous cross evaded every player in the Wigan box until Boyce cleared at the far post. Wigan unfortunately lost Ivan Ramis towards the end of the half when he jarred his knee when challenging Dimitar Berbatov and was stretchered off with ligament damage. They could have snatched all three points when Di Santo ran at the Fulham defence, and fired his shot from 12 yards which Schwarzer did well to turn around the post. As the game moved into injury time the final drama came when substitute Ronnie Stam allowed Bryan Ruiz far took much room to get in his shot and the goal bound effort was superbly headed off the line by Figueroa. It was a crucial moment and the point gained was sufficient to move Wigan out of the bottom three and above Aston Villa on goal difference. The point gained could ultimately prove critical in Wigan’s fight for Premier League survival. This entry was posted in Franco Di Santo, Fulham, Giorgios Karagounis, Maynor Figueroa, Wigan Athletic and tagged Franco Di Santo, Fulham, Giorgios Karagounis, Maynor Figueroa, Wigan Athletic. Bookmark the permalink.